The trade list goes by the breed names on the Encyclopedia, so I don't really see the trade list changing unless the Encyclopedia names change too. So, something to think about for the encyclopedia or a manual change to the list code. It's just a suggestion to consider, but I think it could be done one way or the other. Manual change to the list code would probably cause less user ire. Don't forget Halloweens and, provided that suggestion ever gets accepted, Holiday dragons! Might it be easier to just bubble them up to the top of the list for 3 weeks, starting with the first holiday breeding day? Also, you should probably know that if you *start* manual editing of the list, as opposed to always taking a fresh list from the Encyclopedia, means it would have to be manually edited EVERY SINGLE TIME a new breed gets released. Nobody wants that. I'd really like to see Halloween and Valentine dragons' names changed to Valentine 2010: Sweetling (for example) or Halloween 2009: Pumpkin. This would have the effect that breeds from the same holiday are grouped together - in the encyclopedia, in the market, in the trading hub, on our scrolls and breeding pages (if we use breed sort, not just with the old "Legacy Breed Sort", which I'm keeping for that exact reason). @Ruby Eyes - Gotcha! Yeah, no one wants to have to edit that every time forever and ever amen. But then I am still suggesting the naming convention via the Encyclopedia, as Olympe detailed. During Halloween, I had to remember which dragon was which year, and we're at 12 breeds now! New naming would be a mercy on our memories. Agreed. I personally think that seeing as how we users have names for them, there isn't any reason the 'unofficial names couldn't be made the 'official ones' Like Yulebucks and Radiant Angels and Sweetlings and so on.... easier to remember FAR than what year they were released in! 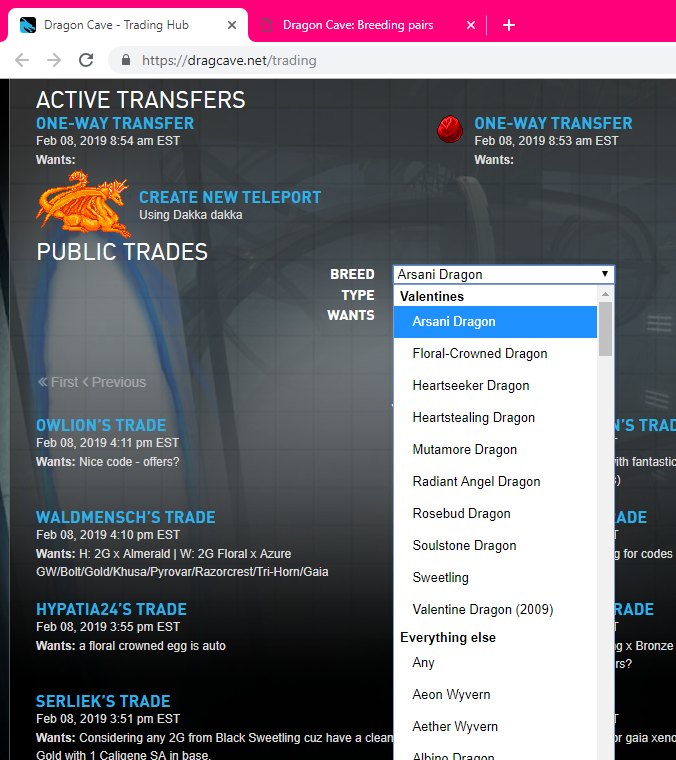 Well, the V-Day and Halloween dragons already go by their breed names (safe for the Val '09, which has "Valentine Dragon (2009)" as its official name). We only need actual breed names for the winter Holiday dragons, but years for the others would be a nice addition. 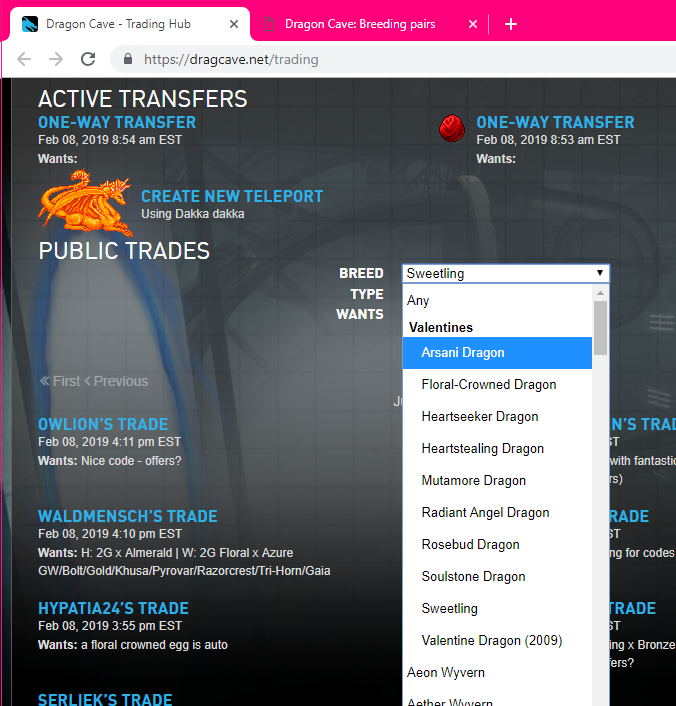 Since browsers commonly let you type the name of an entry in a select dropdown to quickly get to it, I would really rather not see any prefixes (it would mean you can't type "swe" to get to Sweetling, etc; not too big a deal, to type "val" instead and then manually click to whatever breed you want, but it's not really super great, and it's going to get progressively less great the more years pass).